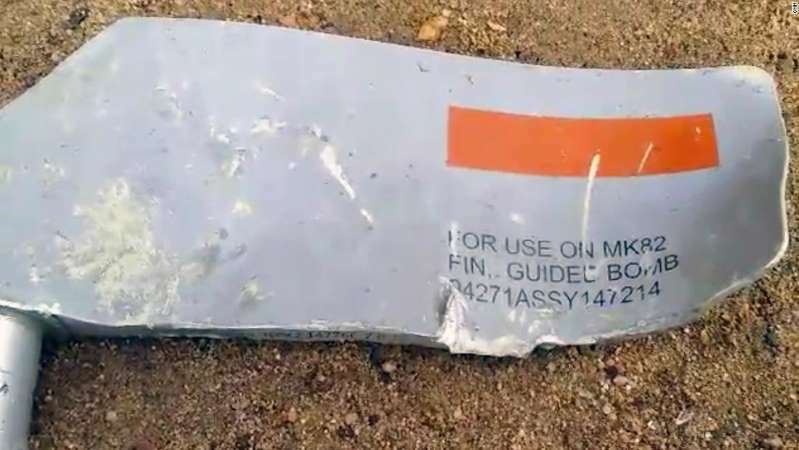 Munitions experts confirmed that the numbers on this piece of shrapnel confirmed that Lockheed Martin was its maker and that this particular MK 82 was a Paveway laser-guided bomb. [post_ads]As the US-backed Saudi-led coalition scrambles to investigate the strike on the school bus, questions are growing from observers and rights groups about whether the US bears any moral culpability. The US says it does not make targeting decisions for the coalition, which is fighting a Houthi rebel insurgency in Yemen. But it does support its operations through billions of dollars in arms sales, the refueling of Saudi combat aircraft and some sharing of intelligence. "I will tell you that we do help them plan what we call, kind of targeting," said US Secretary of Defense James Mattis. "We do not do dynamic targeting for them." The bomb's impact as it landed on the bus full of excited schoolchildren on a day trip was devastating. Images of shrapnel filmed in the immediate aftermath of the attack were sent to CNN by a contact in Saada. Subsequently, a cameraman working for CNN filmed footage of the shrapnel after the cleanup operation had begun. Munitions experts confirmed that the numbers on it identified Lockheed Martin as its maker and that this particular MK 82 was a Paveway, a laser-guided bomb. Asked to comment on CNN's evidence, coalition spokesman Col. Turki al-Maliki said: "The democratically elected government of Yemen has been displaced by an Iranian-backed insurgency by minority Houthi militias." "The coalition is in Yemen with the support of the UN Security Council to restore the legitimate government. The coalition is operating in accordance with international humanitarian law, taking all practical measures to minimize civilian casualties. Every civilian casualty is a tragedy." He added that it would not "be appropriate for the coalition to comment further while the investigation is underway." Saudi Arabia denies targeting civilians and defended the incident as a "legitimate military operation" and a retaliatory response to a Houthi ballistic missile from the day before. A Pentagon spokeswoman, Lt. Cmdr. Rebecca Rebarich, declined to confirm the provenance of the bomb. "The US has worked with the Saudi-led coalition to help them improve procedures and oversight mechanisms to reduce civilian casualties," she said. "While we do not independently verify claims of civilian casualties in which we are not directly involved, we call on all sides to reduce such casualties, including those caused via ballistic missile attacks on civilian population centers in Saudi Arabia." The United Nations has called for a separate investigation into the strike, one of the deadliest since Yemen's war began in early 2015. Since then, the Saudi-led coalition has battled rebels in support of exiled President Abdu Rabbu Mansour Hadi. There have been growing calls in the US Congress for Saudi Arabia, a key US ally in the Middle East, to do more to cut civilian deaths in Yemen, where three years of conflict have taken a terrible toll. On Monday, US President Donald Trump signed a defense spending bill that includes a clause requiring the Pentagon and State Department to certify that Saudi Arabia and the United Arab Emirates, another key coalition member, are doing enough to reduce civilian casualties. This report must be submitted to Congress within 180 days and then annually for the next two years. The US, alongside the UK and France, is a major supplier of arms to Saudi Arabia. Trump signed a nearly $110 billion defense deal with Saudi Arabia's King Salman bin Abdulaziz Al Saud in May last year in the Saudi capital, Riyadh, on what was his first stop abroad as President. In the same month, the US government reauthorized the export of Paveway munitions to Saudi Arabia, ending Obama's December 2016 ban. Retired Rear Adm. John Kirby, who served as a spokesman for the State Department and Pentagon under Obama, said the Saudis had a right to defend themselves against missile attacks from the Iranian-backed Houthis but that the Obama administration did not believe they were striking the right balance between that need and proper care for civilian life. Asked whether the US had moral complicity in the deaths in Yemen, he said: "The issue of complicity is one that international lawyers probably are best to work out, not somebody like me." "What I would tell you is that we certainly had under the Obama administration deep concerns about the way the Saudis were targeting, and we acted on those concerns by limiting the kinds of munitions that they were being given and stridently trying to argue for them to be more careful and cautious." In the immediate aftermath of the strike, al-Maliki, the coalition spokesman, told CNN it had been aimed at a "legitimate target." The Saudi ambassador to the UN, Abdullah Al-Mouallimi, similarly told the Security Council this week that the strike was a "legitimate military action" and that "the targeted Houthi leaders were responsible for recruiting and training young children and sending them to battlefields." "We are not engaged in the civil war. We will help to prevent, you know, the killing of innocent people. I'm very concerned about the humanitarian situation," US Defense Secretary James Mattis said Sunday when asked about the strike. "Wars are always tragic, but we've got to find a way to protect the innocent in the midst of this one." Despite a lack of public condemnation over the school bus strike, there are signs that the Trump administration is taking action behind the scenes. US Secretary of State Mike Pompeo discussed the Saudi-led strike with Saudi Crown Prince Mohammed bin Salman in a call on Monday. A three-star US general also raised the matter while in Saudi Arabia to meet with the Saudi government and other coalition partners, the Pentagon said. "The real key is whether or not the Pentagon can help change the calculus, the thinking, inside the Saudi military," said Kirby. The conflict in Yemen has resulted in the world's worst humanitarian crisis, with more than 22 million people -- three-quarters of the population -- in desperate need of aid and protection, according to the UN.